Megalith is a giant remote-controlled mecha . 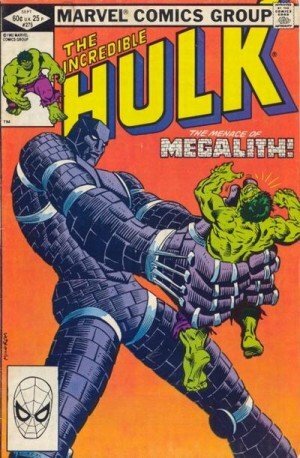 It fought Hulk that one time in a 1982 comic book, and that’s it. However it looks cool and distinctive, it has a good code name and it’s very easy to use in stories. So profiling it seems apposite. Megalith is a giant, remote-controlled humanoid robot. It carries no weapon systems but is immensely strong. Its operator wears a vest, limb sensors and VR goggles and controls the robot’s movements in real time by acting them out. The equipment also provides real-time audio and video feedback, as if physically being the Megalith robot – though it is impossible to speak through Megalith, just hear. The feedback system is way too strong and can convey potentially lethal levels of pain. If the robot is somehow being manhandled the operator will involuntarily tense their muscles, like during an epileptic episode. These muscle spasms of the operator will mimic the robot’s involuntary movements – for instance, when Megalith is knocked back or lifted in the air. Jackdaw postulated that this feedback was the reason why the robot wasn’t deployed, which seems dubious. Issues with signal security seem more likely. Megalith was a giant robot stored at Gamma Base. When the base was shut down in 1981 it was abandoned there. In 1982, mercenary spy Jackdaw (Heather O’Gara) infiltrated the base. She couldn’t resist trying Megalith through its remote control equipment. However, the robot almost immediately ran into the Hulk. A misinterpreted reflexive gesture of Jackdaw triggered a fight. For a few seconds the spy thought that the immense strength of her robot would allow her to dominate the Hulk, but the jade giant swiftly rallied and demolished Megalith. The resultant feedback inflicted terrible pain to Jackdaw, though she managed to fly out of Gamma base undetected. Megalith is armoured with ceramic plates, giving it a stone-like appearance. Growth is Always On and is Already Factored In. Radio Communications conveys real time video and audio feedback. Power Loss — if the operator’ DEX is inferior to Megalith’s, use the operator’s. Megalith’s Initiative is equal to the operator’s DEX (even if this DEX is above Megalith’s). RAPs inflicted to Megalith are inflicted to the operator. Last Ditch Defense is allowed but will only protect the operator, not the robot. Source of Character: Incredible Hulk vol. 2 #275.